If you thought the Amiga software market was dead and buried you were wrong… very wrong indeed… 😉 Turns out a brand new commercial game is about to be released! 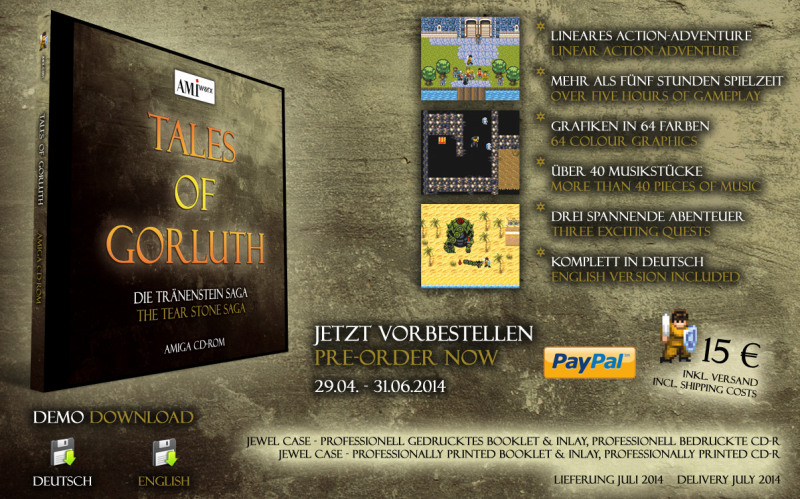 The game is called Tales of Gorluth: The Tear Stone Saga. It has been developed by two guys, Patrick Nevia and Javier Alcaniz. After what I read on amiga-news.de, it is an action adventure offering over five hours of game-play. If you visit their homepage, which is available here (Tales of Gorluth – Homepage), you can download a demo of the game to try it out for yourself (I’ve also included a link in this post, right here). You can also pre-order the game and the be one of the first to get it when it is released in July this summer! I know I’m going to get this one, that’s for sure. Price? Only 15 EUR including postage! Anyone else getting this game? It’s cool. I’ve known that Amiga still has a following 🙂 People LOVE retro! Do you have a wordpress account? Hi Eric! Thanks for commenting. 🙂 Retro seems like the big thing these days – guess a lot of people are in a nostalgic mode. 😉 Yes, have a WordPress account that I use for this blog. It kind of looks (at least from the screen shots) like Ys and the original Legend Of Zelda. You’re going to have to do a review of this game if you buy it. The website doesn’t give too much detail as to what the game’s story is about.